advanced multi-agent navigation, and more. A complete system includes the QBall 2, a ground control station with QUARC, Quanser’s robust real-time control software, and OptiTrack cameras. The open-architecture design allows users to add other off-the-shelf sensors. This presents a flexible, open-architecture platform researchers can use to quickly develop and apply controllers and control algorithms, without having to integrate disparate hardware and software resources. Designed for safe use in indoor laboratories, the QBall 2 is also an ideal tool for teaching basic vehicle navigation and control. Integrating the QBall 2 with other QBall 2 or Qball-X4 (previous version of Quanser UAV) units, QBot and QBot 2 ground robots, or other third-party autonomous vehicles allows researchers to build a flexible, open-architecture, multi-purpose, multi-agent platform for research. The Unmanned Vehicle Systems (UVS) Lab from Quanser provides a turn-key, integrated environment for exploring areas including collaborative control, adaptive control, fault-tolerant control, sensor fusion, fleet maintenance and more, working in an indoor lab environment. The Quanser UVS Laboratory consists of a ground control station with the QUARC real-time control software, QBot 2 ground mobile robot, QBall 2 unmanned aerial vehicle, and the OptiTrack™ localization and tracking system. The Quanser QBall 2 system incorporates the QBall 2 vehicle with a joystick, a ground station with Quanser’s QUARC control software and an OptiTrack camera system. The QBall 2 is a quadrotor helicopter propelled by four brushless motors fitted with 10-inch propellers. 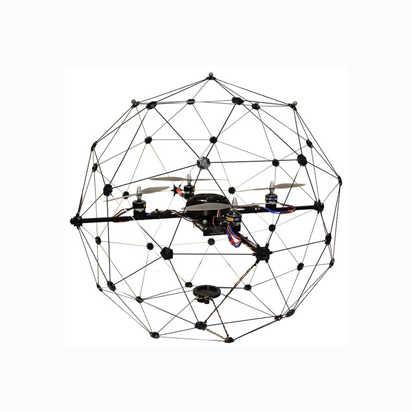 The entire quadrotor is enclosed in a carbon fiber cage (patent pending), protecting the motors and propellers in case of contact with obstacles or collision with other vehicles in the workspace. At the same time, it ensures safe operation in an indoor laboratory environment. The joystick allows the operator to fly the QBall 2 using controls for height, roll, pitch and yaw. When flying the QBall 2 in autonomous modes, the joystick is used to initialize and enable the QBall 2, and acts as a safety switch. The QBall 2 is equipped with built-in 3-axis accelerometer, 3-axis gyroscope, and sonar height sensor. Users can add other off-the-shelf sensors supported by QUARC software, including digital (SPI, UART, I²C) and analog sensors. To measure on-board sensors and drive the motors, the QBall 2 utilizes Quanser’s on-board avionics data acquisition card (DAQ) and a wireless Gumstix DuoVero embedded computer. The DAQ is a high-resolution inertial measurement unit (IMU) and avionics input/output (I/O) card designed to accommodate a wide variety of research applications. The interface to the QBall 2 is MATLAB®/Simulink® with QUARC, Quanser’s real-time control software. The QBall 2 is powered by Lithium-Polymer batteries, ensuring up to 10 min of continuous operation on a full charge. The ground station comes pre-installed with the applicable UVS research software, including Quanser’s QUARC, and OptiTrack Motive software. QUARC targets the Gumstix embedded computer, automatically generates code and executes controllers on-board the vehicle. During flights, while the controller is executing on the Gumstix, users can tune parameters in real-time and observe sensor measurements from a host ground station. The controllers are developed in Simulink® with QUARC on the host ground station. The models are cross-compiled and downloaded to the target computer seamlessly. The position of the QBall 2 in the workspace is tracked and accurately measured using the OptiTrack camera system with six synchronized infrared cameras connected to the ground station. The camera system is customizable, up to 24 cameras can be used for advanced localization requirements. QUARC’s OptiTrack blockset allows users seamlessly interface and control the OptiTrack cameras and allows users to conduct localization-based control experiments in real time more easily. The QBall 2 comes with Quanser-developed materials, including user manual, and pre-designed controllers. With available engineering and technical support, this platform far supersedes possibilities of do-it-yourself solutions, saving researchers’ time and funds, and allowing them to concentrate on the high-level controls aspects of their research projects.